MX / OFF-ROAD 09 THE ONLY NUMBER THAT MATTERS. OFF-ROAD THREE CHAMPIONSHIPS IS NO COINCIDENCE. 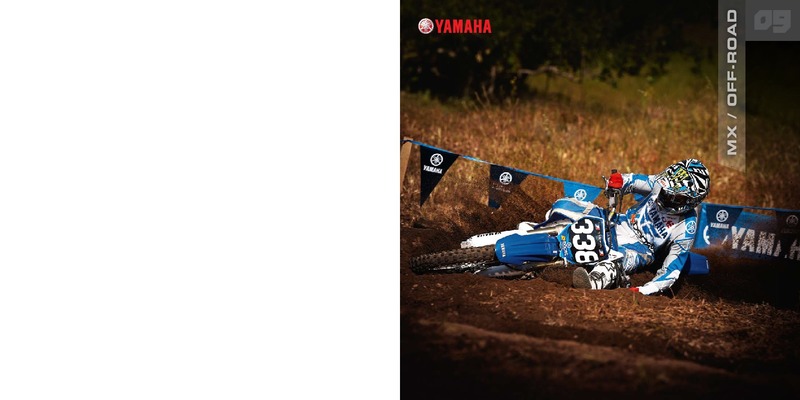 When it comes to pro motocross, there really is no time to relax. Even when you’re in the air, you’re looking for the perfect spot to land and get back on the gas. And even when we just won the AMA Supercross and Supercross Lites West championships with Chad Reed and Jason Lawrence and we are getting set to defend Grant Langston’s #1 Motocross plate, the YZ testing crew is still hard at it, working to make a bike that does exactly what you want it to–an extension of your body wired directly into your nervous system. Brochure Free Download. Operator’s Motorcycle Cataolg Guide. 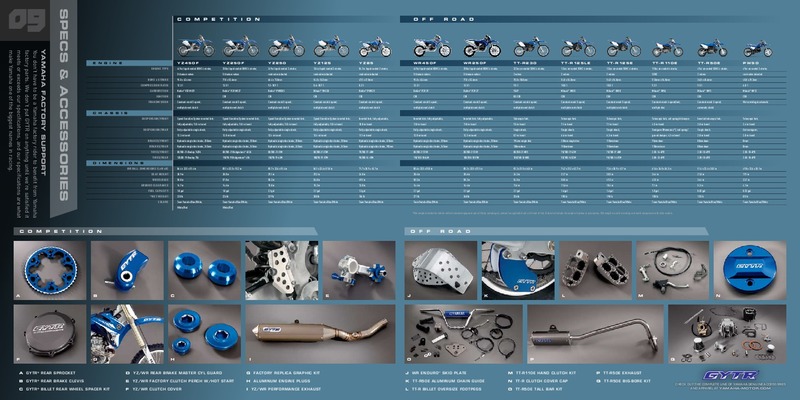 Free Motorcycle and Catalogue Download PDF. Years covered by this manual: 2009. 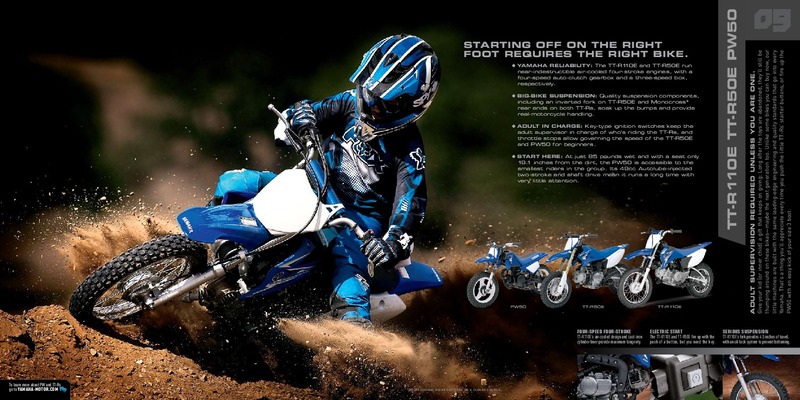 Yamaha has been at it since 1973. We know what it takes: less weight, more controllable power and suspension that lets you carve tighter and put the power down sooner. 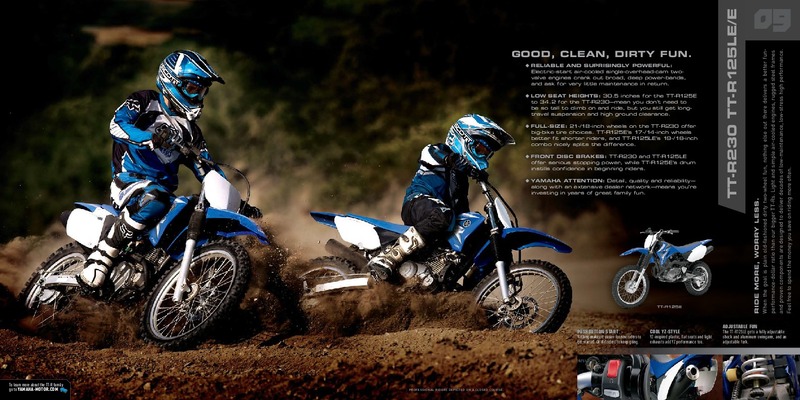 When you’re ready to run up front, that’s exactly where you’ll find the new YZ motocrossers. 09 09 IMPROVING UPON PERFECTION IS OUR BUSINESS. 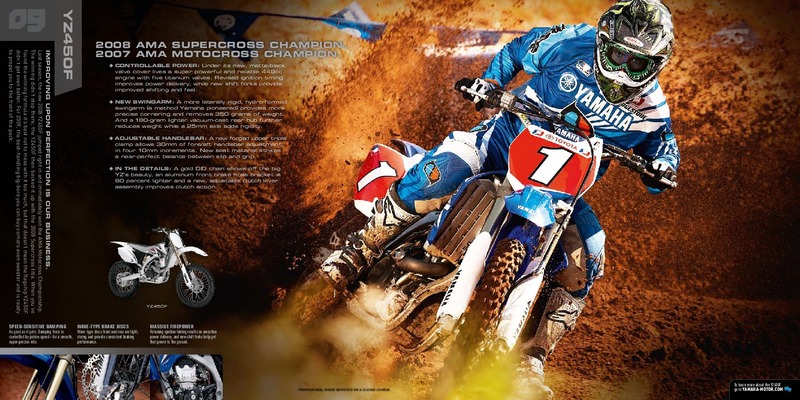 Last season, the new 2008 YZ450F jumped right in and immediately won the AMA Motocross Championship. 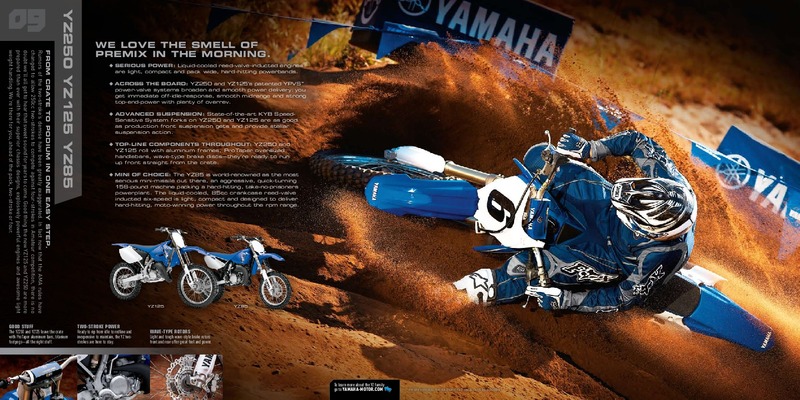 The winning didn’t stop there; the YZ450F then backed it up with the 2008 Supercross title. 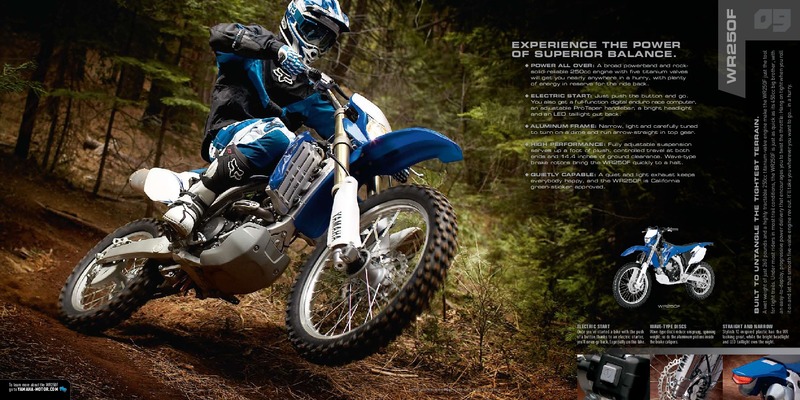 When you’ve found the winning formula it’s best not to mess with it too much, but that doesn’t mean the flagship YZ450F didn’t get even better. For 2009, the best-handling big-bore you can buy corners even sweeter and is ready to propel you to the front of the pack. SPEED-SENSITIVE DAMPING As good as it gets: Damping force is controlled by piston speed–for a smooth, super-precise ride. 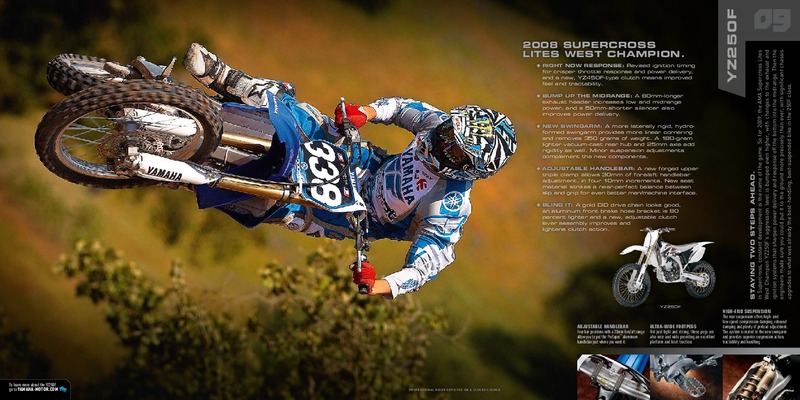 YZ450F 2008 AMA SUPERCROSS CHAMPION. 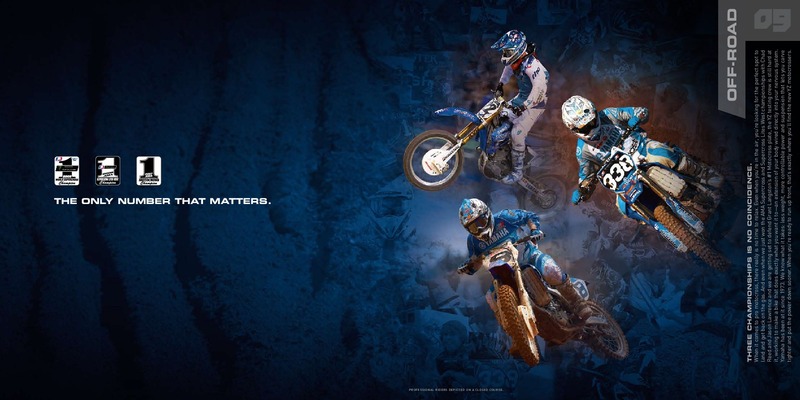 2007 AMA MOTOCROSS CHAMPION. : CONTROLLABLE POWER: Under its new, matte-black valve cover lives a super powerful and reliable 449cc engine with five titanium valves. Revised ignition timing improves power delivery, while new shift forks provide improved shifting and feel. 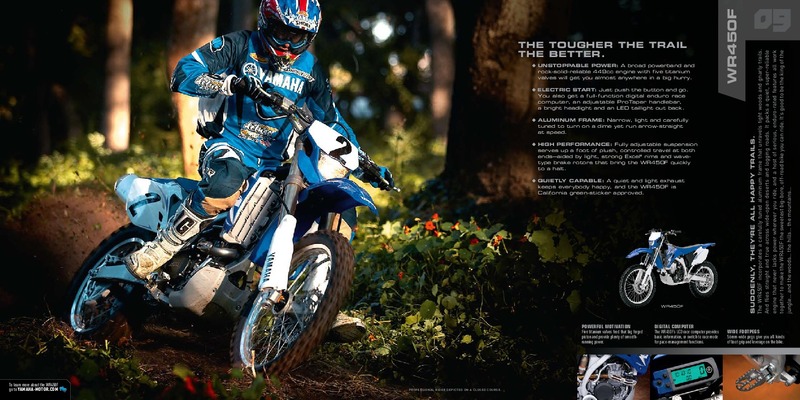 : NEW SWINGARM: A more laterally rigid, hydro-formed swingarm (a method Yamaha pioneered) provides more precise cornering and removes 350 grams of weight. And a 180-gram lighter vacuum-cast rear hub further reduces weight while a 25mm axle adds rigidity. : ADJUSTABLE HANDLEBAR: A new forged upper triple clamp allows 30mm of fore/aft handlebar adjustment, in four 10mm increments. New seat material strikes a near-perfect balance between slip and grip. : IN THE DETAILS: A gold DID chain shows off the big YZ’s beauty, an aluminum front brake hose bracket is 60 percent lighter and a new, adjustable clutch lever assembly improves clutch action. YZ450F WAVE-TYPE BRAKE DISCS Wave-type discs front and rear are light, strong and provide consistent braking performance. MASSIVE FIREPOWER Retuning ignition timing results in smoother power delivery, and new shift forks help get that power to the ground.